Galaxy prints are for sure a trend of the moment; you can see them on leggings, skirts, t shirts, sweatshirts and even on shoes! I have to admit that I love this trend too! The beautiful galaxy skirt I'm wearing come from Chicnova! I think you know I love this eshop because it is always in line with the latest fashion trends and offers a variety of unique items! How not to mention my beloved spiked headband (outfits HERE) or my creepers (outfits HERE)! 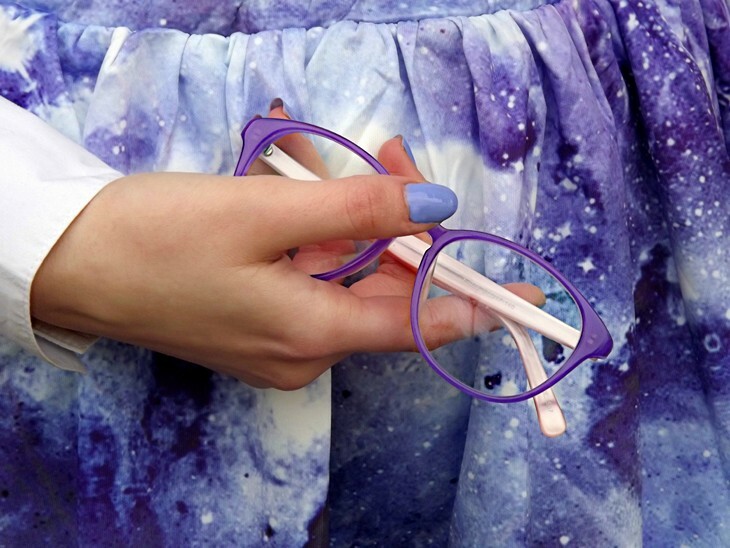 The skirt has many shades ranging from dark blue to lavender and that's why I found the perfect match with my new purple glasses by Firmoo! If you still don't know this brand, check out this post I wrote a few months ago where you can find further information and details about it! I teamed up with them in the past and now I can only confirm my positive opinion: many models and customizations to choose from, great customer service, fast shipping and unbeatable prices! 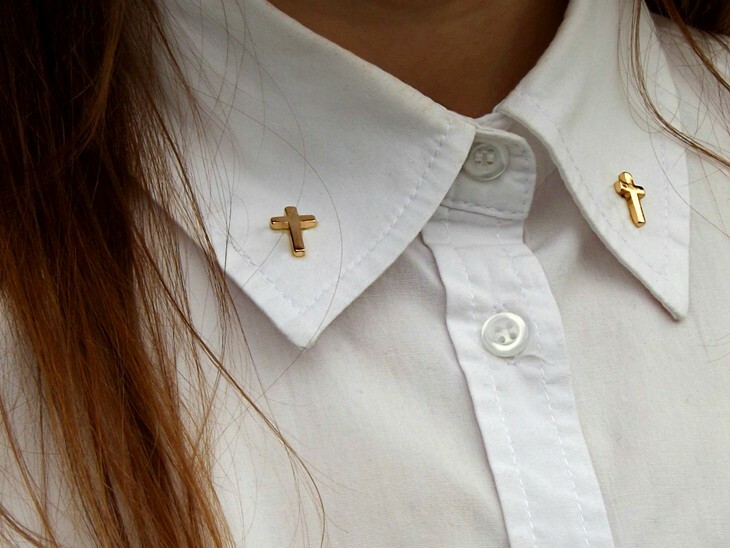 For the rest my outfit is very simple: I added two small gold crosses on the collar of the shirt (yes, I have a passion for crosses!) and I wore mary janes with socks! What do you think? 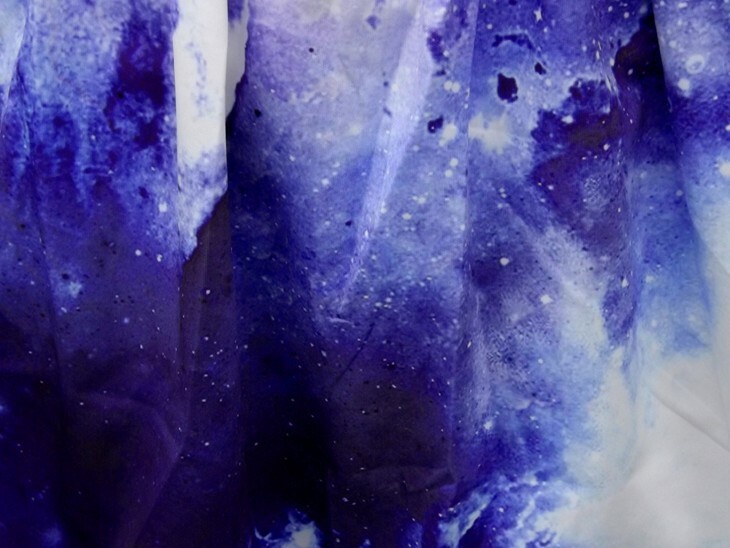 Le stampe galaxy spopolano in questo periodo su leggings, gonne, t shirt, felpe e persino sulle scarpe!! Devo dire che questo trend ha rapito anche me! La meravigliosa gonna galaxy che mi vedete indossare in questi scatti l'ho presa da Chicnova! Se non l'avete capito adoro questo eshop perchè è sempre in linea con gli ultimi trend modaioli e offre un'ampia scelta di capi particolari! Come non citare la mia adorata spiked headband (outfit QUI) o le mie creepers (outfit QUI)! La gonna ha tantissime sfumature che vanno dal blu scuro all'azzurro fino al color lavanda e proprio per questo ho trovato perfetti da abbinarvi i miei nuovi occhiali viola di Firmoo! Se ancora non conoscete questo brand vi rimando a questo post scritto qualche mese fa in cui trovate informazioni più specifiche e dettagliate! Ho già collaborato con loro in passato e anche questa volta non posso che confermarvi la mia opinione positiva: tantissimi modelli e personalizzazioni fra cui scegliere, ottimo servizio clienti, spedizione veloce e prezzi imbattibili! Per il resto l'outfit è molto semplice: ho aggiunto due piccole croci sul colletto della camicia (si, ho una passione per le croci!) e ho indossato le mary jane con le calze! Che ne dite? That skirt is just so gorgeous! I LOVE LOVE LOVEEEEEEEEEEEE IT!! !SO MY CUP OF TEA!!!! omg, the skirt is amazing!! I love it! Very cute and chic outfit! Kisses. Francesca! I looove this skirt & your glasses! Your eye makeup looks stunning! I love that skirt! And your makeup is super pretty! Un outfit diverso dal solito e molto particolare. Il tuo make-up è sempre perfetto. I love matching a accessory color with a piece from the outfit! Beautiful! Che bello questo look!!!! Bellissima la gonna!!! La stampa galaxy non mi è mai piaciuta tanto, ma devo dire che su questa gonna è perfetta! Sarà il colore stupendo, ma sembra un acquarello! La gonna è meravigliosa davvero! Che bello il make up, complimenti! Stai davvero benissimo! !Make up stupendo! !Bellissimi gli occhiali!! super cute outfit. you look so adorable. loving that purple glasses and the skirt too. Great outfit! I love the way you combined your skirt and the glasses! That skirt is gorgeous! We can follow each other! Just let me know! The skirt is stunning. And it looks perfect with the glasses! Keep in touch! (^_^) Happy weekend! Happy Easter too dear! Thanks for your comment. I'm following you. Wow! Really love love this skirt! It´s awesome! I just have a crush with your skirt!! It's amazing, really! I wasn't that passionate for galaxy prints, this was because I saw it only on leggins, but OMG on skirts is much more cute! Thank you for the comment on my blog, and of course we can follow, would be a pleasure too ;) following you already on facebook, GFC, and bloglovin!! (hope you can do it back)kisses!! adoro la gonna!! :D grazie per essere passata, ti seguo anche io!! Thanks for coming to my blog...I'm following you right now!!!!!!! Mi piace la gonna in se, anche se non rispecchia appieno il mio stile, ma sopratutto apprezzo come tu l' hai abbinata. Vista la particolarità è lei a dover essere la vera "protagonista" dell'outfit, e scegliere di indossarla con una semplice camicia bianca e Mary Jane nere è perfetta. Molto carino il particolare dei calzini bianchi, /rende il tutto molto "sbarazzino") e perfetti gli occhiali e lo smalto che riprendono il colore della gonna. Hai dei bellissimi occhi, complimenti. Scopro il tuo blog oggi, se ti va passa da me. Grazie comunque e felice Pasquetta. simply amazing look! you are gorgeous! La gonna è stupenda e pure le scarpe! That skirt is so so beautiful! I loved it and it looks great on you! Make up splendido :) C, xoxo. Thanks for your comment and follow me, of course I'm following you now! 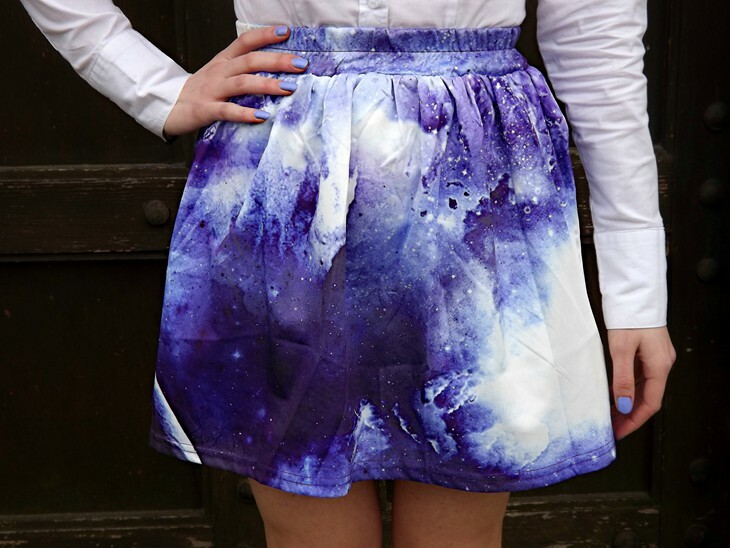 Your galaxy skirt is great! Wow so beautiful eyes! 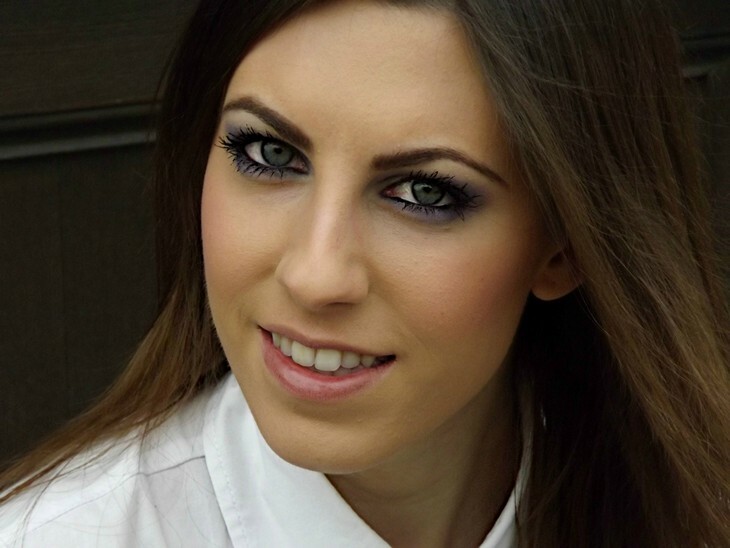 I like your stylish blog and your beautiful pictures! Would be awesome If you‘d take a look at my Blog - would love to keep in touch with you!!! che bel blog Francesca! ti seguo! La gonna è davvero fantastica!!! Mi piace tantissimo il modello e la fantasia! OMG! Never saw a such beautiful galaxy print! What a cute outfit!! Loved your blog!! Thank you for you lovely comment :) We are now following you on gfc, facebook and bloglovin! Son't forget to follow back! Amazing skirt, love your outfit! Thanks for getting back at me dear, I'm following you now too on GFC and FB! stunning, dear!! i'm in love with the skirt. like the fact, that the glasses are fitting to the skrit. wonderful blog dear, check out mine if you want!! maybe you'ld like to follow? You have such an amazing style Francesca, I love your outfit. You can Win 30$ to spend on Chicnova.com! I'm obsessed with this look, love the skirt! I'm now following.. can't wait to see more! Nuova follower,se ti va potremo seguirci a vicenda! Whoa! That skirt is far out! And those shoes... seriously outta this world! Ok... done being cheesy! I came across your blog and am your newest follower. I would love if you’d visit me at : the daily savant : and (if you like) follow with GFC and Blog Lovin'! You are Uh-mazing!! Loving your style. Thanks for following me. I've now followed you back. followed you & hope you'll love mine and follow me back. 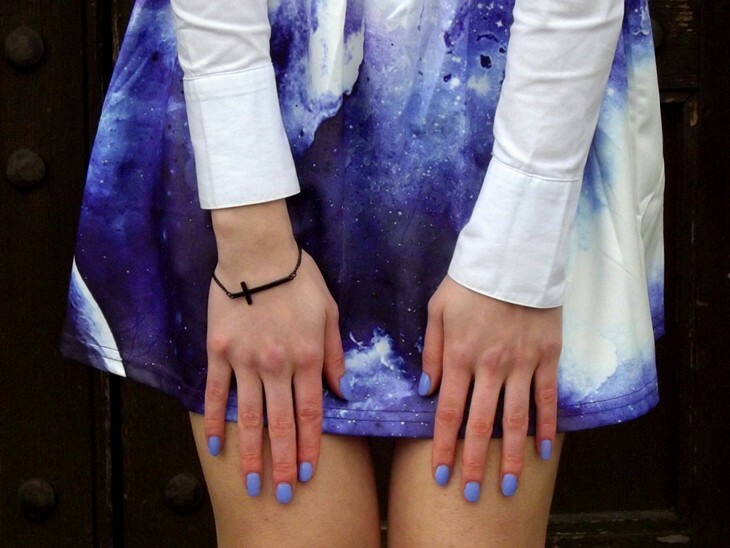 In love with that galaxy print! So bold but so amazing. Hello My dear, I seriously love the purple glasses with this lovely skirt!